The Telegraph’s Mandrake reports on a golden opportunity for pious posturing seized upon by the Muslim Association of Britain. 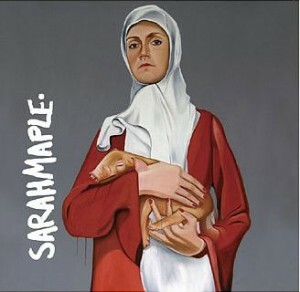 Upcoming artist Sarah Maple has an exhibition at the Salon Gallery which contains a painting of a woman in a veil carrying a piglet! Naturally, vice-president of the MAB Mokhtar Badri is outraged, and plans to lead a group of protestors to the gallery to demand that the filthy painting be taken down. Although we condemn violence, Muslims have a right to express their disgust at this work […] An artist has the right to free speech and to express him or herself, but people also have the right to protest. She clearly wants to provoke a strong reaction from Muslims and that is what she will get. Well, yes, you do have a right to protest Mokhtar – but you are not really in a position to make any demands. And you ought to think of the impression you are creating. Muslims believe that all of God’s creatures should be treated with respect, but we are taught to keep our distance from pigs because they are unclean. That is why this picture is so offensive to us. Eh? It’s not a real pig, it’s painting of a pig. It’s not a real woman, it’s a painting of a woman. UPDATE: (Nov 25) To be fair to Mokhtar Badri, he has denied saying “She clearly wants to provoke a strong reaction from Muslims and that is what she will get.” He claims that the Telegraph’s Mandrake misquoted him. 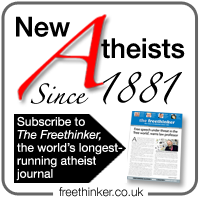 ‘Muslims believe that all of God’s creatures should be treated with respect’…. How do you stone women to death respectfully, then? The Muslim council offended? Who cares? Hmm, muslim women aren’t the only ones who wear scarves … might be trying to read a bit too much into that painting, perhaps? It’s a strange painting, and an odd thing to get upset about. Does anyone know precisely why this should be offensive to muslims? Given that no-one’s asking them to hold a pig. Ah, but if they *see* a woman flagrantly and provocatively holding a pig, then they might be tempted to do it to. These attacks on paintings, film, theater, etc. amount to cultural terrorism. I forgot to say beofre, if they’re so offended by the picture, they could always hang it. Who knows why, I am not surprised about these attacks, I would have been surprised if the usual violent imbeciles whom for ‘feeling to be Muslims’ need to show their small brains and alleged big muscles, would have spoiled this tasty occasion for gifting us with their anti-social behavior. Yet I have to admit that Miss Maple’s works (in particular the videos, photos and paintings full of sexual innuendo of very little artistic values) are not what I would call art. I know that other critics of art have expressed some doubts about her production. I wonder, indeed, how much the ‘muslim’ themes of her works may be a short-cut for an ‘easy’ success. But this is just my opinion.